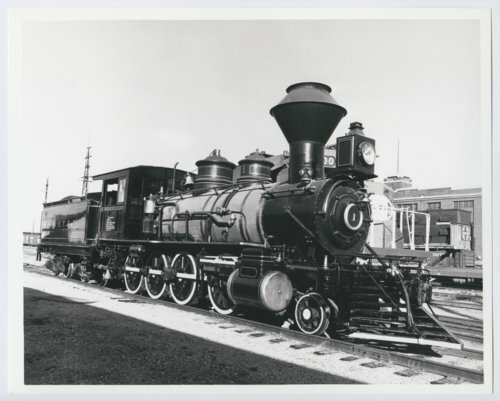 This black and white photograph shows the Atchison, Topeka & Santa Fe Railway Company's steam locomotive #1 possibly in the Santa Fe yards in Topeka, Kansas. The locomotive, commonly known as the Cyrus K. Holliday, was built in 1880 by the Baldwin Locomotive Works of Philadelphia, Pennsylvania with a 2-8-0 wheel arrangement and assigned the road number of #132. The success of this locomotive to climb the steep grades of the Raton Pass on the Colorado-New Mexico border prompted ATSF to order ten more for service. These were numbered from 130 to 139. In 1977, Santa Fe Railway officials donated the locomotive to the Kansas Historical Society for placement in the museum's main gallery in Topeka, Kansas.